If you want to travel from the Thailand / Malaysia border on the Padang Besar to Hat Yai train (Keretapi dari Padang Besar ke Hatyai), there are two relatively cheap Shuttle services a day, as well as the International Express that stops there on its way to Bangkok. There are just two departures a day from the border to Hat Yai, with the duration of the journey, just under one hour. These trains are fairly comfortable and now comprise of 4 or 5 third class, fan-cooled coaches (originally there were just two, 2nd class air-conditioned coaches). 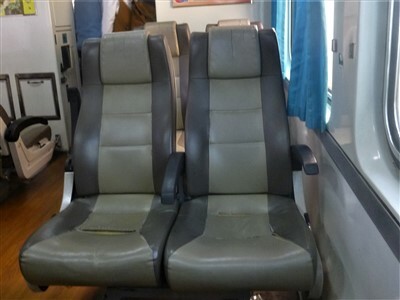 Seats on board the Padang Besar to Hat Yai Shuttle Train services for the 2nd Class air-con coaches (now changed to 3rd Class). 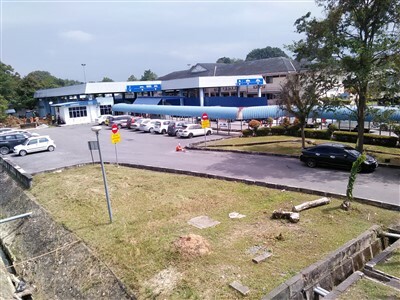 If you are taking an ETS or Komuter train to Padang Besar, plan to arrive at least an hour before the Shuttle train departs if you can, to give yourselves time to clear passport control and buy your train tickets. Train number 948 leaves Padang Besar daily at 08:55 am Thai Time (09:55 Malaysian Time) - Arriving in Hat Yai at 09:50 Thai Time. Train number 950 leaves Padang Besar daily at 15:40 Thai Time (16:40 Malaysian Time) - Arriving in Hat Yai at 16:35 Thai Time. The first stop after just a couple of minutes is at the Padang Besar Railway Station in Thailand. The second is at Klong Ngae (only locals get on and off here). This long distance service from Padang Besar to Bangkok is to be avoided for this short trip, as it will cost you around 5 - 6 times as much (due to the fare structure used by SRT - Special Express trains are very expensive for short journeys). Currently, you will have to pay 272 Baht to use this train just to get from Padang Besar to Hat Yai. Train 46 leaves Pdg. Besar daily at 17:00 (Thai time) - arriving in Hat Yai at 17:55. How much does the Train to Hat Yai cost? If you do not have any Thai currency, they will accept Malaysian Ringgit for the Padang Besar to Hat Yai route from PB Station in Malaysia, but it is always best to pay in Thai Baht as the exchange rate you get for Ringgit will not be that good. Where to Buy Tickets for the Padang Besar to Hat Yai Train? 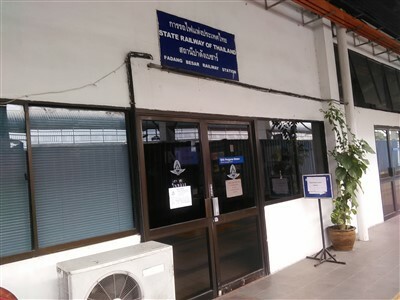 To buy your tickets to Hat Yai Junction, you will have to go to the State Railway of Thailand (SRT) ticket office located at the northern end of platforms 1 /2. This office is usually shut and only opens for ticket sales around an hour before departure in the morning, about two hours before the afternoon departure. This is the only place to buy tickets for the Shuttle trains and you can not currently purchase them online from SRT or from any online agents. The immigration area for both Thailand and Malaysian immigration is between platforms 1 and 2 and only open when trains are due to arrive or depart across the border. If you are leaving Malaysia to travel to Hat Yai by train, you will first have to get stamped out of Malaysia, then stamped into Thailand. For travellers departing Padang Besar, you will first have to wait for the Shuttle to arrive from Hat Yai. Passengers on the train will be processed by immigration first, then once they have all been cleared, departing passengers can then go through immigration. One thing you should be aware of is that when these trains are busy, they are often delayed due to all the people having to be processed by immigration in such a short period of time. You would think they would open earlier to make sure the train leaves on time! If you find yourself at Padang Besar railway station with hours to wait for the next Shuttle service to Hat Yai, there are alternative ways to get to Hat Yai. The first thing you have to do is leave the train station (without getting your passport stamped) and use the main land border crossing. Go upstairs to the cafe, where there is a pedestrian bridge that leads over the tracks to the main border (do not go out of the front of the station as there is nothing here apart from a car park and Malaysian taxis). Once you come down the stairs, the Malaysian border is just a couple of minutes walk to your left. If you want to get a taxi to Hat Yai or a motorbike taxi to take you across the border, you will find them all waiting at the bottom of the stairs. The walk between borders is 5 to 10 minutes and there is a large Duty-Free shop halfway if you want to do some shopping. Once cleared through Thai immigration, you now have a choice of taking a cheap, but a very slow local bus to either the bus station or city centre in Hat Yai, or you can walk into town and take a minibus to Hat Yai bus station. You can also take the same trains from the Padang Besar Railway Station in Thailand. Trains leave just a couple of minutes later than the times shown above.